There are few players that can consistently impact games like elite NFL pass rushers do. 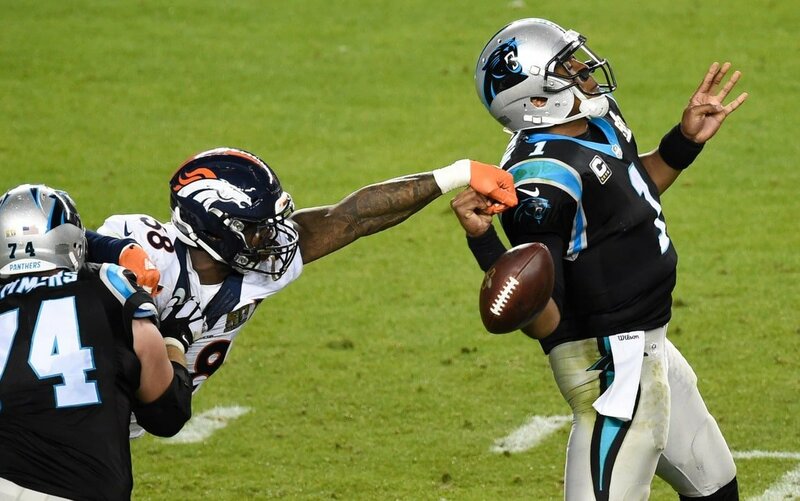 Think Von Miller in Super Bowl 50, or Aaron Donald in…well, in any game he’s played recently. These players are the ones who can turn even the best quarterbacks into shells of themselves by constantly hitting them and making them run for cover. With that in mind, we’ve ranked the top-15 NFL pass rushers heading into the 2018 season. The Browns got a nice taste of what Garrett is capable of doing in his rookie campaign. He appeared in just 11 games, earning nine starts thanks to a couple of injuries. But when he was able to play, he certainly looked like a No. 1 overall pick. With seven sacks and a forced fumble, Garrett utilized his exceptional combination of size, speed, power and athleticism to devastating effect. If he can stay healthy in 2018 he’ll be among the NFL’s sack leaders at the end of the season. Take away the 2012 and 2015 seasons (Achilles injuries), and all Suggs has done in his past six healthy seasons is pile up 66 sacks. What’s even more remarkable is that he logged eight and 11 sacks in the two seasons since his second Achilles tear. The only reason T-Sizzle isn’t higher on this list is that he’s going to turn 36 this season. But make no mistake about it: he’s still capable of getting to the quarterback on a regular basis and remains one of the league’s best at this discipline. Heading into his fifth NFL season, Lawrence only has one season under his belt as a full-time starter, and he’s missed significant time due to injury in two of his four seasons. Yet the two seasons he has remained healthy speak for themselves. 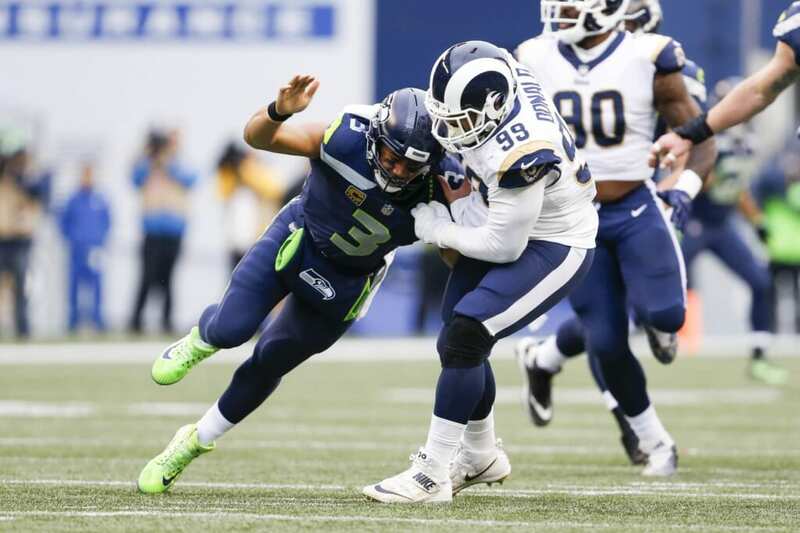 He had eight sacks as a part-time starter in 2015, and then last year in his first full season as the primary pass rusher for Dallas he piled up the second-most sacks in the league, finishing with 14.5. 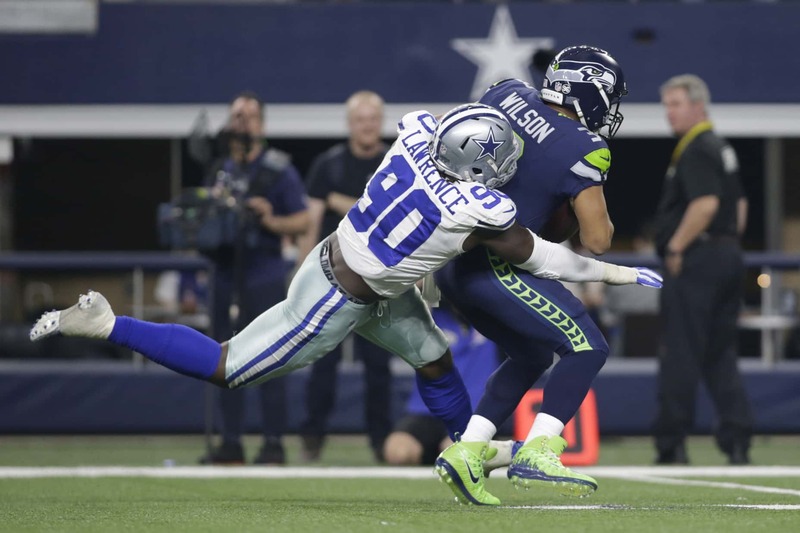 The Cowboys weren’t ready to dole out a monster long-term deal but happily used the $17-plus million franchise tag to lock Lawrence up and see if he can continue producing at that elite level. There are many talented pass rushers roaming around on Philly’s defensive line. But none make as consistent an impact as Cox, who’s the linchpin of the entire machine. He doesn’t have the sack totals to match up with anyone else on this list (21.5 sacks the past three seasons), but his ability to disrupt the pocket from the defensive tackle spot is nearly unrivaled. Last year, according to Pro Football Focus, only Aaron Donald had a better pass-rushing grade among interior lineman than Cox. Somewhat overshadowed these days by his explosive young teammate (whom we’ll discuss later), Ingram is nevertheless one of the league’s top pass rushers. Since bursting onto the scene as a viable superstar in 2015, he’s tallied 29 sacks. And last year, on top of the 10.5 sacks he had, he hurried opposing quarterbacks 53 times, which ranked fifth among edge defenders in the NFL. The Chargers are a nightmare for opposing offensive lines, with both Bosa and Ingram working the edges. Wake has been giving opposing offensive tackles bad dreams for the better part of a decade. Like Suggs, he’s recently come back from a torn Achilles tendon and hasn’t missed a beat. Since his injury in 2015, Wake has sacked opposing quarterbacks 22 times, adding an interception and five forced fumbles. He’s likely to take on a bit more of a part-time role this year, but that could serve to only make the snaps he does take all that more effective. 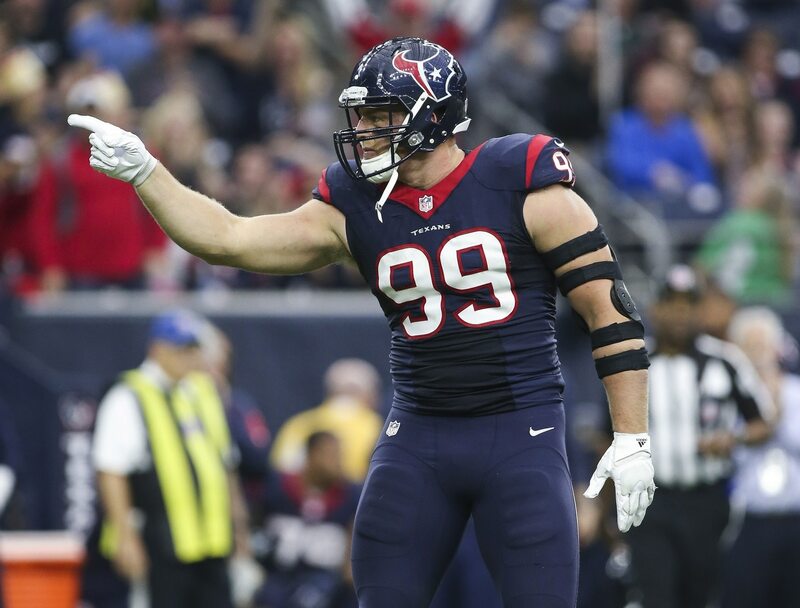 If it weren’t for the recent rash of injuries suffered by this three-time Defensive Player of the Year, Watt would be one of the top players on this list. As it stands, even though he’s missed most of the past two seasons, Watt remains among the most dangerous pass rushers in the league. What he did between 2012-15 (69 sacks) is one of the best four-season stretches in league history. If Watt can stay healthy, then we have little doubt he’ll get back to terrorizing opposing quarterbacks on a regular basis in 2018. There might not be a better overall 4-3 defensive end in the NFL right now, in terms of a player who plays the run and the pass, and who does all the little things it takes to be great. As a pure pass rusher, Jordan is absolutely in the elite class, too. Since 2012, he has tallied 58.5 sacks, despite having absolutely nobody on the other side of the defensive line to take pressure off him. He’s also coming off a career-best 13 sacks last season. If rookie Marcus Davenport lives up to the hype, then Jordan is due for another career year in 2018. Griffen might soon be overtaken on this list by fellow defensive end, Danielle Hunter, who is coming on strong at the age of 23. But over the course of the past four seasons, Griffen has tallied 43.5 sacks and is coming off a career-high 13 in 2017. What’s even more remarkable about Griffen’s 2017 season is that he had 10 sacks in the first half and was slowed down in the second half after suffering a foot injury. He’s also a darn good run stopper who anchors one of the best defensive lines in the NFL. The 2016 Defensive Rookie of the Year (despite missing four games), Bosa has been on a tear since holding out during his rookie campaign. He’s played in just 28 career games and has 23 sacks, not to mention four forced fumbles last year. He combines speed and power to devastating effect, often bull rushing offensive tackles right into their quarterbacks. If Bosa can stay healthy over the long term, he has a real shot to end his career as one of the NFL’s all-time greats. Campbell has always been one of the most disruptive pass rushers in the NFL. Before landing in Jacksonville as a free agent last year, be played inside as a defensive end in Arizona’s 3-4 scheme. Once unleashed on the edge last season, he was utterly dominant, finishing the season ranked second in sacks with 14.5. Additionally, according to Pro Football Focus, only Chandler Jones had more sacks/knockdowns than Campbell, who finished last year with 31. Over the past three seasons, there aren’t many players who’ve been as consistently successful at bringing down quarterbacks as Jones. Since 2015, he’s piled up 40.5 sacks and led the entire league last year with 17. The New England Patriots aren’t used to getting the worst of a trade, but in the case of their trade with Arizona to send Jones to the desert it really seems like it was a big mistake. He’s one of the most disruptive pass rushers in the league and seems to only be getting better with age. Nobody in the NFL combines speed and power off the edge like Mack does. Even in a “down” year last season, he had 10.5 sacks, bringing his three-year total since 2015 up to 36.5. Mack hasn’t had a ton of help, either. The addition of Bruce Irvin has produced mixed results, but the real issue is that the Raiders haven’t had much talent in the interior of their defensive line. If rookie Maurice Hurst can stay healthy and gets up to speed quickly, he’ll greatly impact Mack’s production off the edge. That’s a scary thought. What Donald has done since entering the league as a first-round pick out of Pittsburgh in 2014 is nothing short of remarkable. He’s a defensive tackle. He hardly ever comes off the edge. He also missed all of training camp last year as a holdout, missing two games in the process, yet he finished the season leading the league with 91 pressures, per PFF. In his four NFL seasons, Donald has racked up a staggering 39 sacks and nine forced fumbles. He’s death on a white horse as far as interior offensive linemen are concerned, not to mention the quarterbacks he routinely rag-dolls. No wonder he’s likely going to hold out again as he looks to become the richest defensive player in NFL history. 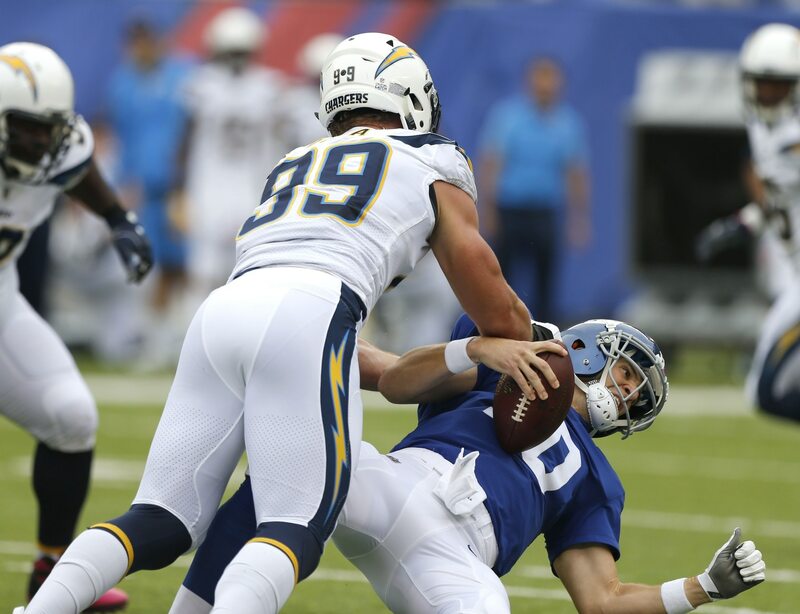 Barring his suspension- and injury-shortened 2013 season (played in just nine games), Miller has put up double-digit sack totals every year since entering the league as the second overall pick of the 2011 NFL Draft. In 104 career games, he’s tallied 83.5 sacks, which is an absurd average of 0.8 sacks per game. Miller also gets pressure on quarterbacks more than any other pass rusher in the game today. He is, quite simply, the most dangerous edge defender in the NFL. And it’s not really that close.